Four make-ahead smoothie pack combinations that are stored right in your freezer! Save time by making these freezer smoothie packs ahead that just require 1 cup of liquid and blending to have breakfast or snack ready in no time. Make-ahead smoothie packs have been on my must-share recipe list for the longest time. I finally got around to sharing and I am excited to tell you about these. These are totally customizable and you can add whatever you want to your freezer smoothie bags. All you have to do is add your liquid when you are ready to drink and then blend it up. Mornings for me are super busy. I wake-up, hop on the treadmill, get my daughter up, get her ready for the day, take a shower some days, get ready for work, grab my lunch and breakfast and run out of the house for work. I usually take oatmeal to work in a mason jar and just heat it up when I get to work. Sometimes though, I get sick of oatmeal and want something different. As the weather is getting warmer, a cold smoothie sounds appealing. 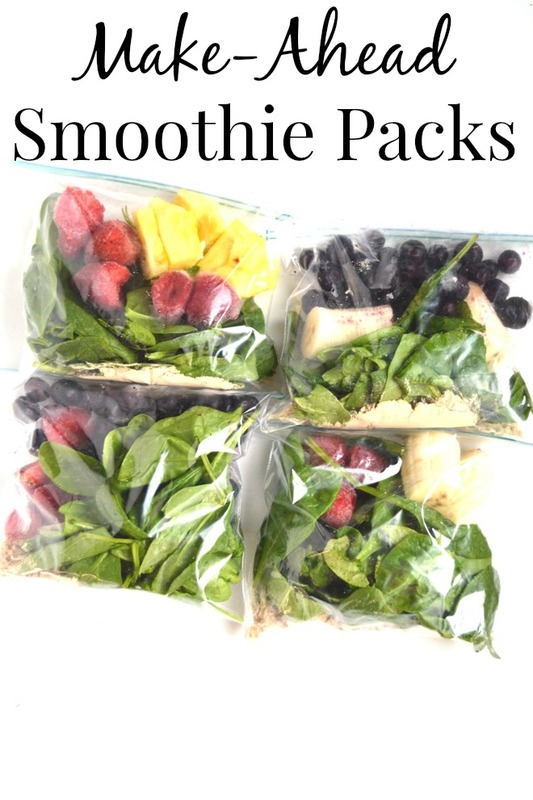 By making these smoothie packs ahead of time, you can save a few minutes each morning. Also, you do not always need to have all of these fresh ingredients on hand at home. If your fresh spinach wilts, you know that you have these in the freezer all ready to blend up. So easy! Add a scoop of protein powder to a sealable sandwich bag. Add spinach and then fruit. Seal bag and store in freezer. When ready to eat, dump ingredients into blender with 1 cup of milk or beverage of choice and blend. Enjoy! **These store well in the freezer for at least a couple of months. Feel free to use whatever smoothie combinations that you enjoy! This recipe uses Purely Inspired Organic Protein 100% plant-based nutritional shake which worked well in this recipe to give a boost of protein and nutrients. The protein mix is dairy, gluten and soy free. Flavors include French vanilla and decadent chocolate. Each serving has 20 grams of protein, 7 grams fiber, 2 grams sugar and is 130 calories. It contains an organic fruit and veggie blend with spinach, broccoli, flax and blueberry. It contains a blend of proteins including organic pea protein and organic brown rice protein.